Independence is encouraged. Residents are free to pursue their favorite pastimes. Staff provides friendship, assistance and reassurance. Social, cultural, recreational, educational, wellness, and spiritual activities are offered as part of the daily programs. Assisted Living at St. Catherine’s Village is a step in the Continuing Life Care™ program—a step that we believe can be rewarding and fulfilling with the proper care philosophy. Personal Care Attendants assist residents as needed with bathing, dressing and grooming. Residents can enjoy three meals a day in our elegant Lake View Dining Room, with snacks and beverages offered in between. A Registered Nurse is available 24 hours a day, 7 days a week, to provide medication supervision and check in on the well-being of all. Marian Hall accommodates 60 residents. Each lives in a personally furnished private room. Private baths include showers with built-in seats and assist bars for comfort and safety. Two large, bright sunrooms provide a common area for gatherings or leisurely pursuits. St. Catherine’s Village conforms to the Mississippi State Department of Health regulations for Assisted Living for admission to Marian Hall. 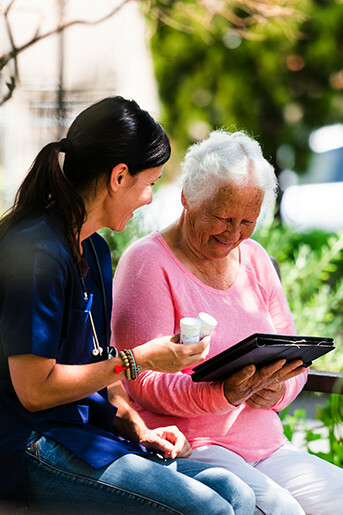 An evaluation to determine whether Assisted Living could adequately meet the individual’s identified needs is fundamental to the application process. An individual who is not part of the Continuing Life Care™ program can apply for admission directly to Marian Hall if availability permits.